What is Kriek I here you ask? Kris: People know what Kriek is. Caroline: I didn’t. Don’t you want to explain what it is? 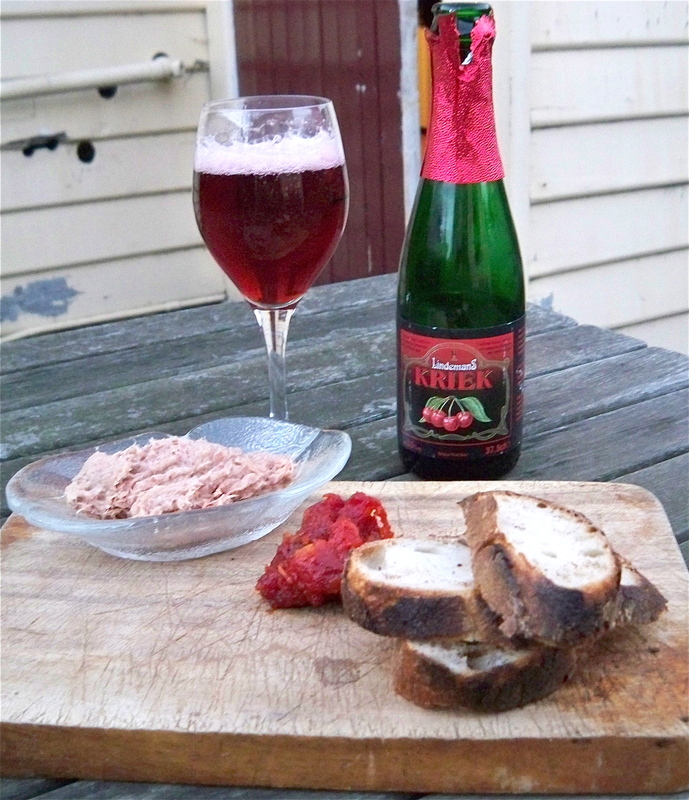 Caroline: Kriek is a Belgian Beer made from fermenting Lambic with sour cherries. 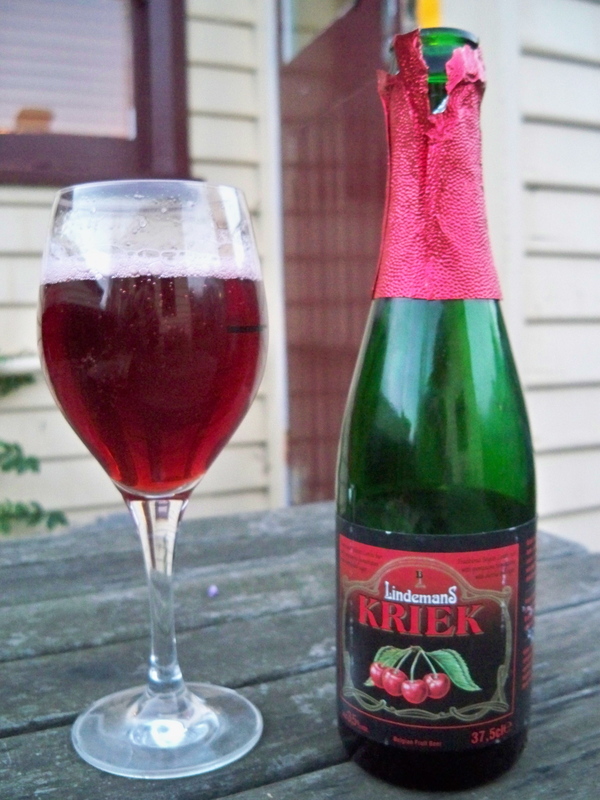 In fact, Kriek is the Dutch word for the type of cherry used. 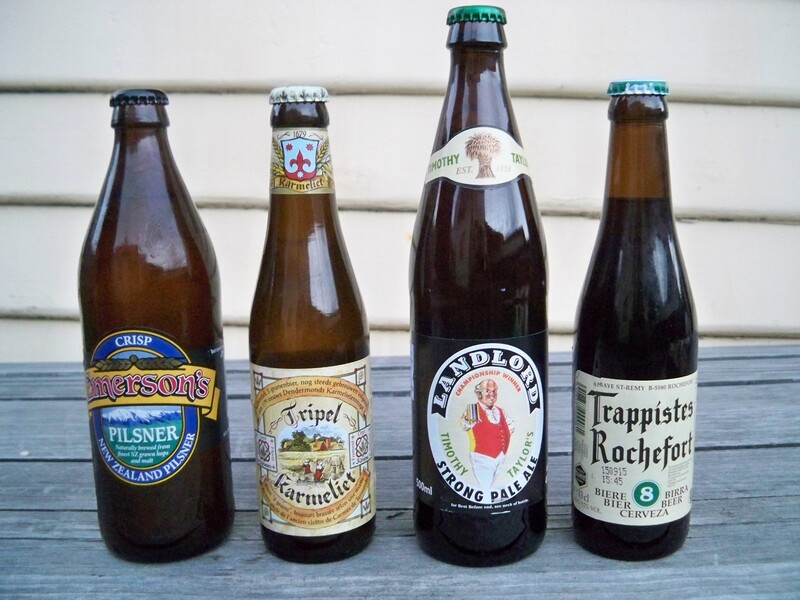 Side note: for those who don’t know what a lambic beer is either (also like me), it is a belgian beer produced by ‘spontaneous fermentation’: it is exposed to wild yeast and bacteria as opposed to controlled brewer’s yeast. 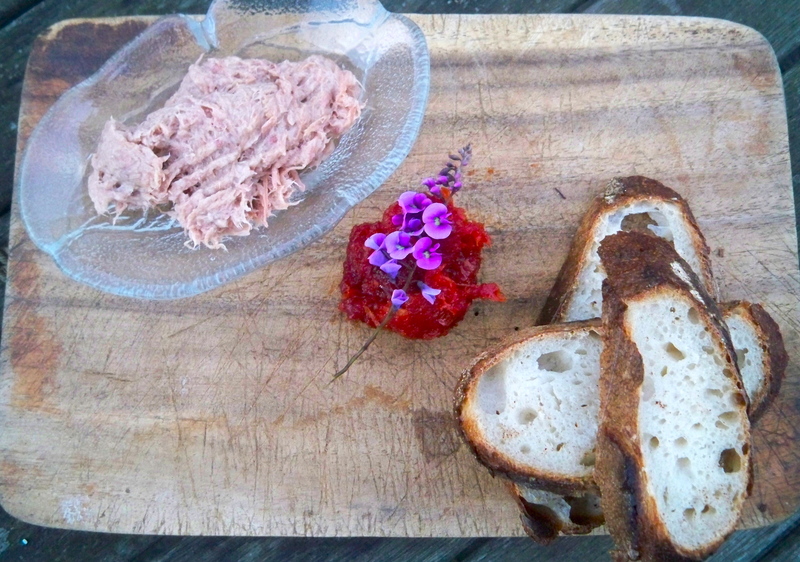 We sipped Kriek and ate Duck Rillettes on crusty bread with my homemade Lemon Myrtle Chutney. Lemon myrtle is a native Australian rainforest tree and the leaves have a beautiful sweet lemon/lime taste when used in cooking or marinating. Ta dah! you have delicious lemon myrtle chutney! Rillettes is a preparation of meat, similar to a pâté, wherein the meat is salted and slow-cooked in fat for a LONG time. It isn’t too hard to make, just a bit time consuming. It is worth the effort though. Kris: I have to say, I love duck, in anything really. We tend to eat fairly rich foods in winter; which is nearly over, so I am making the most of it. Lindeman’s Kriek is a bit sweet for me. I prefer Liefman’s Goudenband and Cantillion Kriek as they are a lot more tart and acidic. They would really cut through the richness of rillettes. Caroline: YUM. Any meat cooked in its own fat is ok by me. The lemon myrtle chutney cut the saltiness of the rillettes really nicely for me. I think they’re both delicious on their own as well. The Kriek was a bit sweet for me, I would never be able to drink one by myself, but it was nice to sip. I thought it matched nicely with the rillettes and chutney. It was sweet and a bit tangy and not too heavy. Thought cheese matching was just for wine? Well, think again! 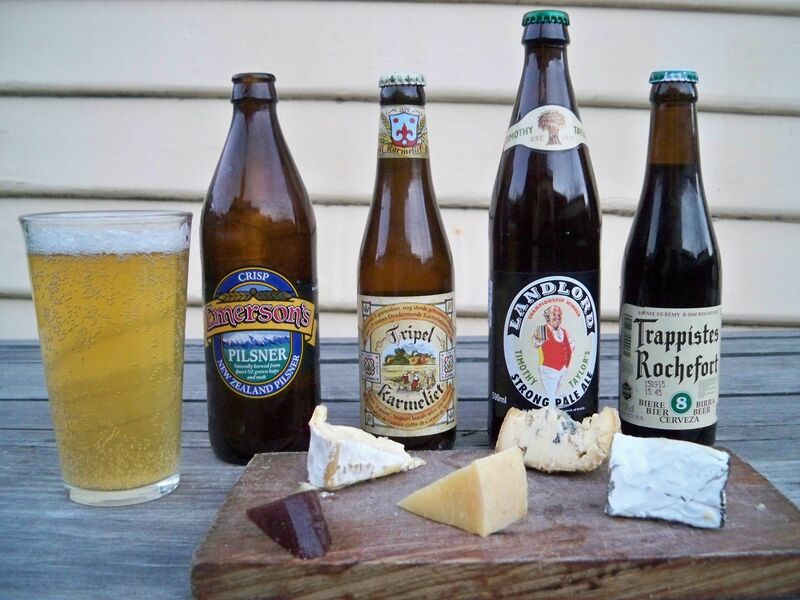 Tonight we had 4 Australian cheeses with quince paste and tasted/matched them with 4 international beers. I matched the Brie with Emmerson’s Pilsner from New Zealand. I love the aroma of the New Zealand hops in this beer.The dryness and citrus flavour of the beer cuts through the richness of this creamy, french style brie. Tripel Karmeliet is a perfect match for the Woodside ashed goats cheese. Hefeweizens also pair really well with goats cheese, particularly Chevre. The salty, nutty flavour of the aged Pyengana cloth bound cheddar goes really well with a malty English Pale Ale. Timothy Taylors is one of my favourites. Finally Rochefort 8 with Grandvewe Sapphire Blue. The cheese is a ripe, creamy blue made from organic sheeps milk. It needs a big beer to match it’s rich flavour. These two are a match made in heaven. 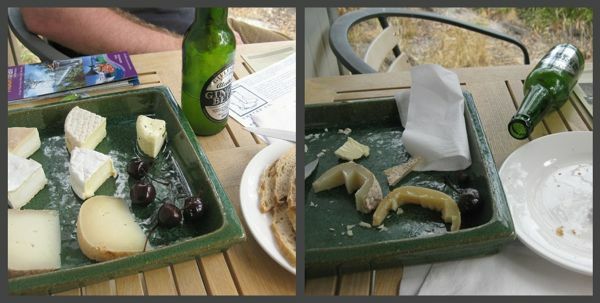 Beer is an extremely versatile match with food and particularly cheese. There really is no right or wrong. Part of the fun is experimenting and finding out what works and what doesn’t.